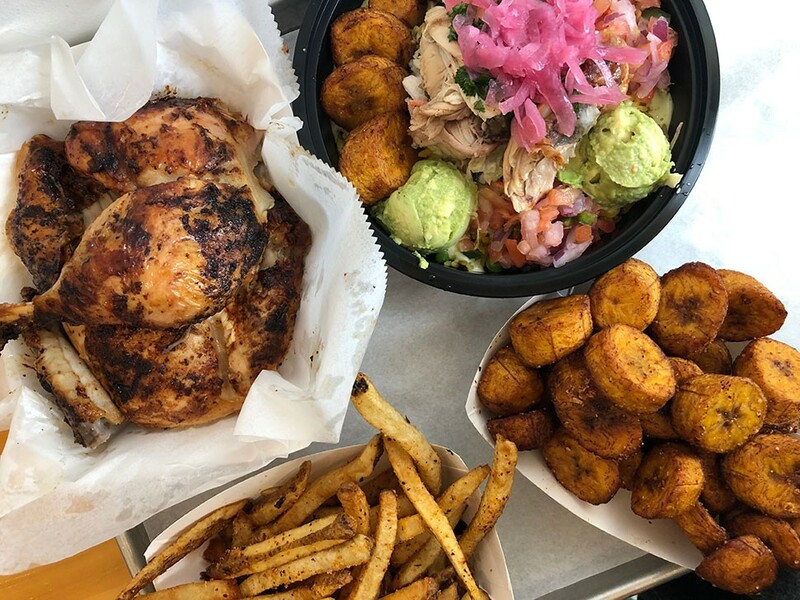 If you happen to find yourself on the strip of Berlin Turnpike in Wethersfield (let’s say you’ve gone bowling or whipped through Stew Leonard’s) and feeling a bit peckish, a stop at the fast-casual joint, El Pollo Guapo is in order. This Spanish-accented rotisserie leans healthy, with offerings like 1/4 or 1/2 a chicken accompanied by roasted Brussels sprouts, spicy corn or charred broccoli. We, of course, did not resist the chili lime fries and salty plantains, so our meal was not exactly virtuous. There’s a warning about “bold flavors” on the menu and you can ask for lightly seasoned if you’d like, but folks who like their grub spicy and salty will love this place. We dove into a “Guapo Bowl” of Arroz Con Pollo, not your usual melange of chicken and rice, but here in my favorite “bowled food” style, with scoops of mashed avocado, garlic lime slaw, pickled onion, and shredded chicken atop a healthy helping of rice. You’ll find plenty of salads on the menu, plus tacos, empanadas and nachos and a $7 kids menu. (Vegans and vegetarians have options, too). It’s all a little tongue in cheek (Guapo AF is their tag line) and popular: we witnessed a steady stream of take-out orders at lunch. We grabbed a whole rotisserie chicken for the week ($32 with three large sides) and it made for a few day’s meals (the spicy slaw is a winner). While I’m not sure I’d drive up to Wethersfield just for a “handsome” chicken, if you’re in the neighborhood, it’s a fun and tasty stop.